Review posted February 7, 2019. Greenwillow Books, 2018. 278 pages. Review written March 7, 2018, from a book sent by the publisher. After reading the first few chapters of this book, I thought I’d stumbled on a book that had the same basic story as The Journey of Little Charlie, by Christopher Paul Curtis – except in Little Charlie the young innocent was forced to journey with and help a slave catcher, and in The Book of Boy the young innocent was forced to journey with and help a relic thief. But I was quite wrong. 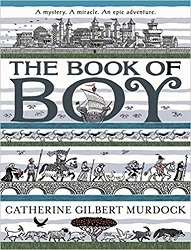 Although The Book of Boy started out this way, the story that followed was completely different from anything I'd read before. Yes, Boy is young and innocent. He’s a hunchback and doesn’t like the way people are afraid of him and call him a monster. The book is set in medieval Europe, just after a Pestilence has gone through the land. A pilgrim demands his aid in carrying a pack. Boy thinks they are going to protect a relic of Saint Peter, but it turns out the pilgrim will use Boy to steal more relics. We learn some interesting things about Boy and about the pilgrim along the way. The pilgrim can’t touch any relics of St. Peter, but for Boy, the relic already in the pack warms him and makes it so people don’t notice his hump. Every morning when Boy wakes up, no matter where they have camped, animals curl up and sleep with him. What’s more, after a while we realize all the talking Boy does to animals isn’t just rhetorical. Animals understand Boy and talk to him as well. Secundus the pilgrim wants to gather seven relics of St. Peter, and he has a compelling reason. And although he is indeed a thief, he grows under our skin as their journey continues. But Secundus the pilgrim doesn’t win us over as fully as Boy does. He is indeed a young innocent forced to help with thievery – but he learns things along the way about his own true nature which are most surprising. This is ultimately an uplifting book, full of details about life in medieval times. You’ll enjoy the company of the good-hearted Boy, who can talk with animals and is very surprising.